Nine years ago, I published an interview in two parts of Lt Gen S.K. Sinha. He was then the Governor of Jammu and Kashmir. 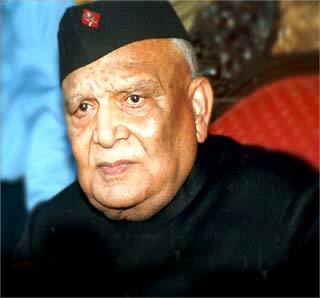 General Sinha passed away yesterday at the age of 90. As a homage to the great soldier and statesman, I repost his interview. Lieutenant General Srinivas Kumar Sinha (retired), PVSM, is the governor of Jammu and Kashmir. Described as one of India's most outstanding post-independence generals, his distinguished military career includes combat service in Burma and Indonesia during World War II. In 1946, when he was a captain, he worked for a year with Major Yahya Khan, who went on to become a general and then the military ruler of Pakistan. After Independence, he was a major at Army Headquarters in Delhi during the 1947-1948 war in Kashmir, and was later named secretary of the Indian delegation on delineation of the cease fire line in Kashmir at a meeting convened by the United Nations in 1949 in Karachi. He sought premature retirement in 1983, and has since served as India's ambassador to Nepal, and governor of Assam, among other positions. In an exclusive interview with Claude Arpi at the Raj Bhavan in Jammu, General Sinha, 80, describes how India responded during to the first India-Pakistan war over Kashmir in 1949, how the two nations have fared since, and expands on his special version of Kashmiriyat. Your Excellency, you can oversee the Kashmir issue from a very unique position. You actively participated in the 1947-1948 operations; in 1949, you were the secretary to the cease fire negotiating team in Karachi; since 2003, you are the governor of the State of Jammu and Kashmir. I would like to begin with some questions about the first operations in Kashmir. Let me first tell you that there is a lot misconception or misinterpretations about Kashmir. There is propaganda started by Pakistan and lapped by the West, especially during the Cold War. They say it was premeditated aggression by India and an illegal act because India had sent her troops into Kashmir even before the maharaja had acceded (to India).